August Sander left an immense body of work — hundreds of images as prodigious as they are unsettling. From 1920 to 1954, he photographed his fellow Germans, casting light on people in the shadows and bringing us face-to-face with the intriguing truth of a time when the “persecuted” and their “persecutors” — Communists, gypsies, political prisoners, members of the Hitler Youth, soldiers, SS officers and Jews — came before his camera. 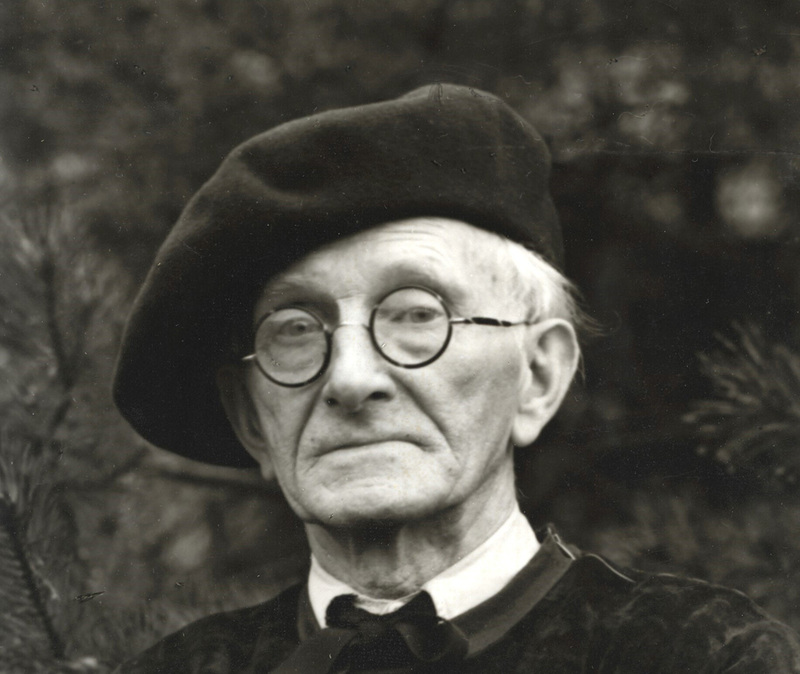 August Sander was born 17 November 1876 in Herdorf, near Cologne. A miner’s son, in 1890 he quit school to work in the pit. At 16, he acquired his first camera, discovering a medium to which he took with a passion. In 1897, during his military service in Trier, Sander worked as an assistant in a photo studio. He later pursued his apprenticeship in Berlin, Magdeburg, Halle, Leipzig and Dresden before moving to Linz, Austria, going into business for himself as a professional photographer in 1904. Married and a father of four, in 1910 Sander joined his parents in Cologne, opening a professional portrait studio at 201 Dürenstraße. After entering the army in 1914, his wife, Anna, ran the studio on her own until 1918. A pacifist and socialist, Sander was deeply affected by the horrors of the First World War. He now saw his pre-war portraits of farmers in a different light. Rejecting the deliberate blurriness characterizing early 20th-century art photography, Sander instead stressed contrasts bringing out the traces that hard work left on his models’ hands and faces. In the early 1920s, Sander grew close to the circle of Cologne’s avant-garde artists, including Franz Wilhelm Seiwert and Heinrich Hoerle, who started the Cologne Progressive movement (Die Progressiven). Those relationships, as well as political conversations with his son, Erich, and his son’s friends, influenced his work. In 1927, Sander entered the public eye for the first time with a highly successful show of over 100 photographs at the Cologne artists’ league, the Kölner Kunstverein. The enthusiastic response to his first book, Antlitz der Zeit (Face of Our Time), in 1929, encouraged him to pursue the project. Things to see in the exhibition: a selection of pictures showing the artistic circles in which August Sander moved as well as portraits from the book Face of Our Time. Gunther Sander, August Sander in Kuchhausen, c. 1956/1958, silver-gelatin period print. © Die Photographische Sammlung/SK Stiftung Kultur – August Sander Archiv, Cologne; VG Bild-Kunst, Bonn; ADAGP, Paris, 2018. Courtesy of Gallery Julian Sander, Cologne and Hauser & Wirth, New York. 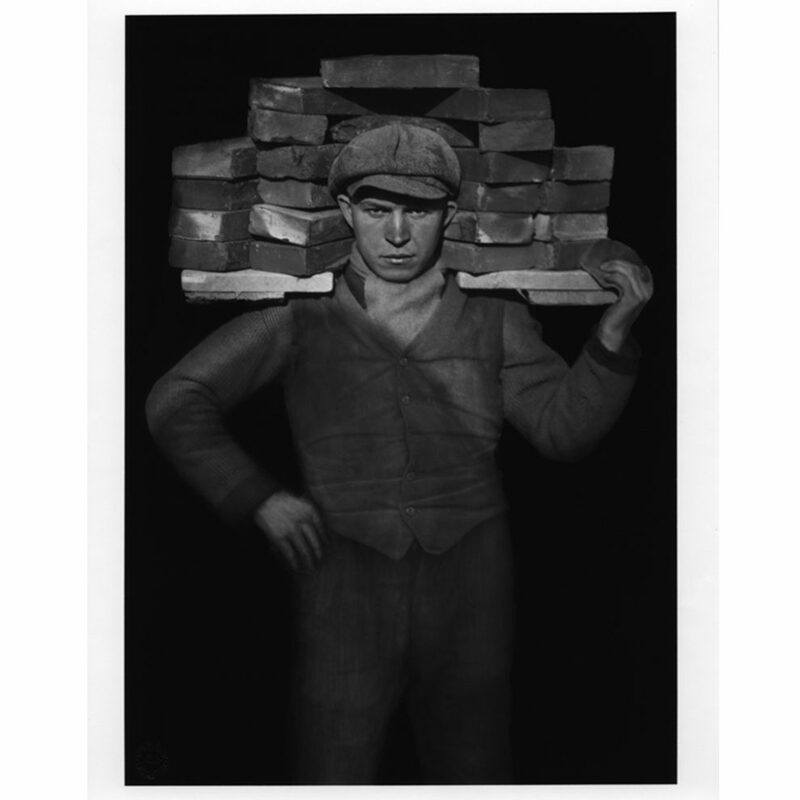 August Sander, The Bricklayer, 1929, silver-gelatin print, 1990. © Die Photographische Sammlung/SK Stiftung Kultur – August Sander Archiv, Cologne; VG Bild-Kunst, Bonn; ADAGP, Paris, 2018. Courtesy of Gallery Julian Sander, Cologne and Hauser & Wirth, New York. 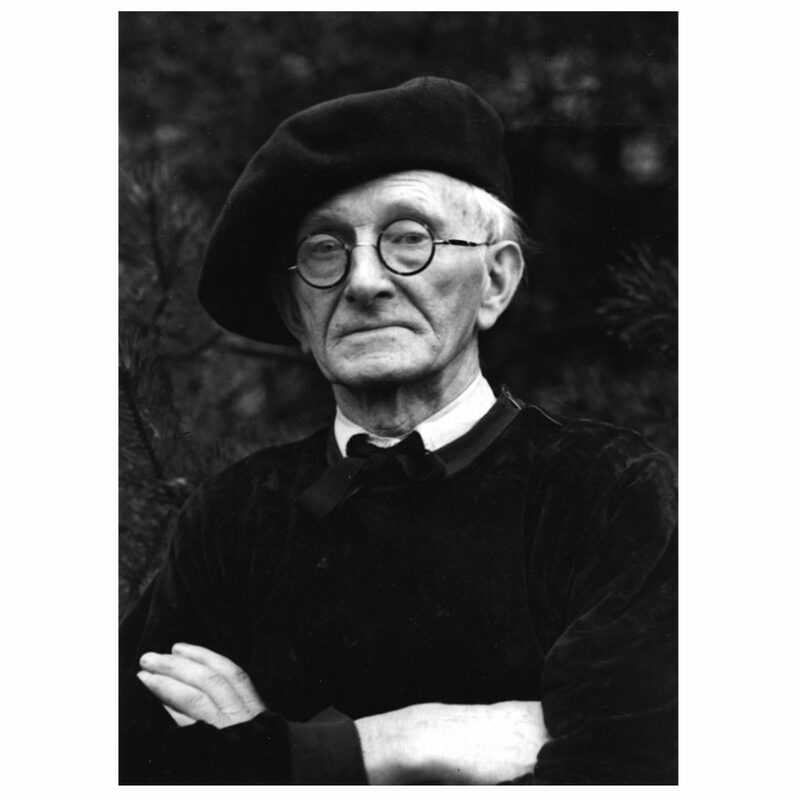 Although Sander continued shooting until 1954, nearly all the photographs in his major work, Menschen des 20. Jahrhunderts (People of the 20th Century), date from the Weimar Republic. He classified these hundreds of portraits into seven groups: “The Farmer”, “The Craftsman”, “Woman”, “Classes and Professions”, “The Artist”, “The Big City” and “The Last People”. He did not have the time to finish his work. His descendents completed the final project on the basis of written instructions he left. Sander photographed people in 600 professions, from farmers to soldiers, army officers, politicians, street performers, businessmen and waiters. The series starts in the countryside and ends in the big city, with its beggars, unemployed and cripples — those “marked by life”, whom he called ”The Last People”. 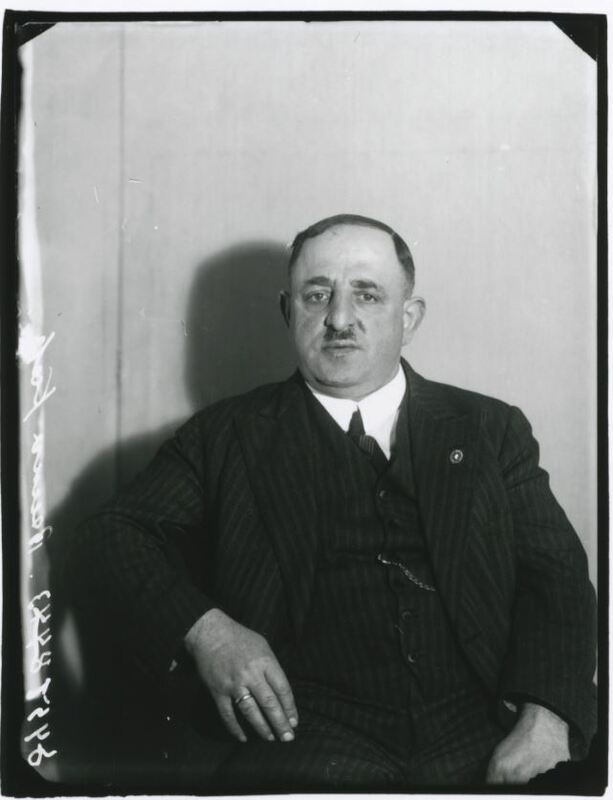 After the war, he added the “Political Prisoners” portfolio, including photographs taken by his son Erich, jailed in 1934 for his political opinions, and portraits of Cologne’s Jews made for identity documents in 1938-39 as they tried to flee Nazi Germany. Stylistically, Sander combined a documentary approach with amazing technical rigor: careful poses and controlled contrasts take us beyond the visible. Social differences — reflected in the models’ body language or in items symbolizing their professions — create what he called “physiognomic snapshots” of his time. Sander wanted his legacy to be a true-to-life portrait of 20th-century German society. His obsession with the truth makes his photographs incredibly modern, earning them a key place in the history of the portrait. Their “serial” nature heightens their impact and influenced many artists, including Diane Arbus and Bernd and Hilla Becher. Things to see in the exhibition: portraits of farmers, intellectuals, politicians, anarchists, democratic leaders, etc., representing a cross-section of 1920s German society. Jews have lived in Cologne since 321 CE. Massacred, expelled in 1424, allowed to return in 1798, they did not obtain equal civil and political rights until the German Empire was founded in 1871. In 1920, Cologne’s 16,000 German Jewish citizens were an integral part of the city’s life. Many belonged to the middle class and the bourgeois elite. When the National Socialists came to power in 1933, Jews were gradually excluded from political and social life, dismissed from their jobs and forbidden to marry “citizens of German blood”. In late 1938, hundreds of Polish Jews who had been living in Cologne for decades were expelled to Poland. The events of Kristallnacht on 9 and 10 November 1938 dashed any hopes that the Nazis might ease up on their anti-Semitic policy. Hundreds of men were arrested and interned in Dachau. Jews were plundered, taxed and expropriated. In 1938 and 1939, Sander made many portraits of Cologne’s Jews, who, compelled to have their identity papers re-issued with the letter “J” stamped on them, beat a path to his studio door. Even though the portraits were made for a functional purpose, Sander treated them with care, sensitivity and gravity. The first deportations took place in autumn 1941, the last in spring 1945. There were almost no survivors. 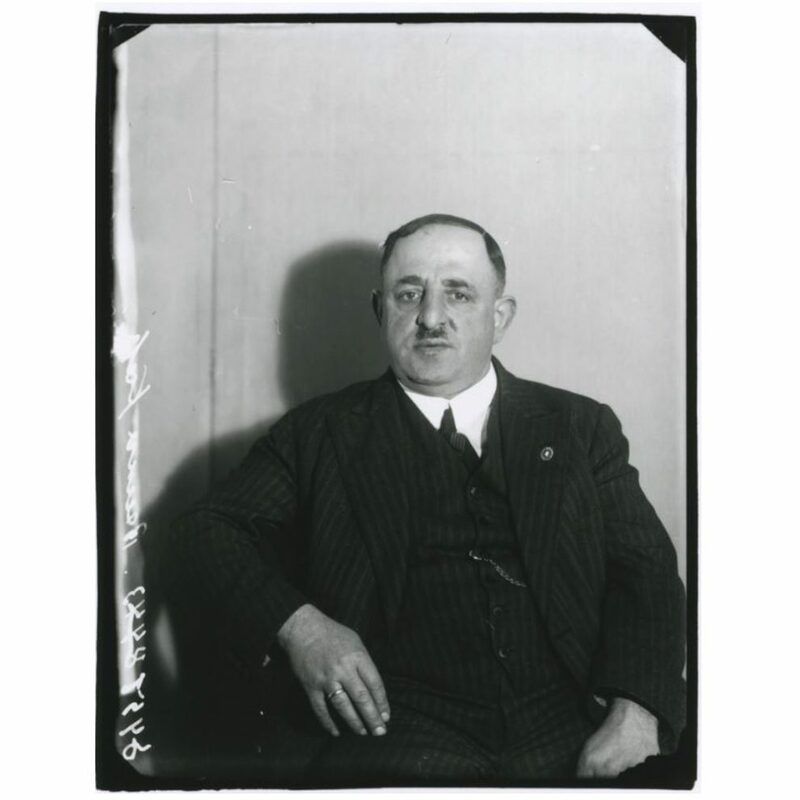 Things to see in the exhibition: exhibited for the first time, 40 contact prints* of Cologne’s Jews and political prisoners, including those that Sander and his descendents did not choose for People of the 20th Century. Biographical information accompanies the portraits. * Contact print: an image the same size as a negative (here 12 x 9 cm), enabling contact sheets to be obtained in order to choose which picture to reproduce. 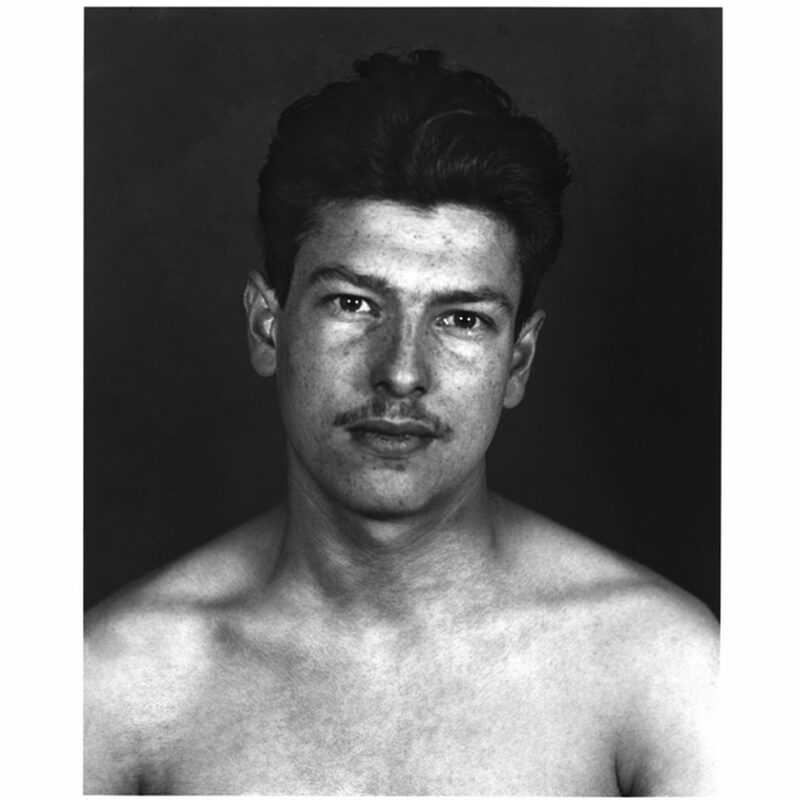 August Sander, Persecuted [Benjamin Katz], ca. 1938, contact print, 1990-2011. © Die Photographische Sammlung/SK Stiftung Kultur – August Sander Archiv, Cologne; VG Bild-Kunst, Bonn; ADAGP, Paris, 2018. Courtesy of Gallery Julian Sander, Cologne and Hauser & Wirth, New York. August Sander, VI/44a/7, Political Prisoner [Marcel Ancelin], Portfolio VI/44a — The Big City, Political Prisoner, 1943, silver-gelatin print, 1990. © Die Photographische Sammlung/SK Stiftung Kultur – August Sander Archiv, Cologne; VG Bild-Kunst, Bonn ; ADAGP, Paris, 2018. Courtesy of Gallery Julian Sander, Cologne and Hauser & Wirth, New York. Erich, Sander’s eldest son, was born 22 December 1903 in Linz, Austria. By 1914, he adhered to socialist ideas. In September 1922, he joined the Communist Youth League. A staunch Social Democrat, August disapproved. But father and son agreed on one thing: photography, Erich’s passion. In 1924, Erich joined the German Communist Party, the KPD. Disenchanted, he left the organization and by October 1932 had become head of the rival Socialist Workers’ Party, or SAP. After Hitler came to power, Erich joined the Resistance, writing leaflets and reproducing them in the family attic. When printing paper ran out, Erich would resort to photography, enlisting his father’s help — an undeniable act of resistance to National Socialism. On 11 September 1934, Erich was arrested by the Gestapo and subsequently sentenced to 10 years in prison. in 1936, he became the Sieburg prison photographer, which allowed him not only to make numerous photographs of daily life there, but also to carry on his resistance work. With his parents’ help, he managed to smuggle photographic paper into the prison and photographs out of it. In March 1944, Erich came down with appendicitis. Taken to the hospital when it was too late, he died on 23 March. Grief-stricken, August had a death mask made of his son, set up a shrine to his memory in his office and added his pictures to the People of the 20th Century “Political Prisoners” portfolio. Things to see in the exhibition: 10 images from the “Political Prisoners” portfolio that Erich Sander made between 1934 and 1944, including self-portraits, photographs of other prisoners and scenes from prison life. Gerhard Sander, August’s grandson and Erich’s nephew, “Postface to Erich Sander’s Correspondence”, in NS-Dokumentationszentrum of the City of Cologne (ed. ), Erich Sander. Gefängnisbriefe 1935-1944, Berlin, Metropol, 2016, vol. 2, p. 341. Far from exalting the Aryan race and the superman myth, the wide variety of Sander’s portraits and the models’ often-austere expressions reflect a harsh social reality that flew in the face of the Nazi regime’s basic principles. In 1936, the National Socialist regime banned Face of Our Time and destroyed the photographic plates. Three years later, the outbreak of war prompted Sander to move to the Westerwald, taking 10,000 negatives with him to keep them safe. Unfortunately, the 30,000 that he left behind in the cellar of his Cologne house were destroyed by a fire in 1946. As part of the project and his work cataloguing contemporary German society, Sander also photographed members of the SA, SS and Hitler Youth. Their poses, gazes and smiles often make us forget their functions. These are not just portraits of SS officers or Nazis, but men. After the war, Sander added the portraits of uniformed Nazis, his son Erich’s photos of political prisoners and the pictures of Cologne’s Jews to People of the 20th Century. Sander restored the dignity of those whom Nazi Germany tried to dehumanize. He returned them to their rightful place within the German community by bringing their portraits and those of their persecutors together. Perpetrators and victims left their mark on the century and on their country. Things to see in the exhibition: 12 portraits of Nazi Party members (soldiers, officers, SS men and members of the Hitler Youth), most from the early 1940s. 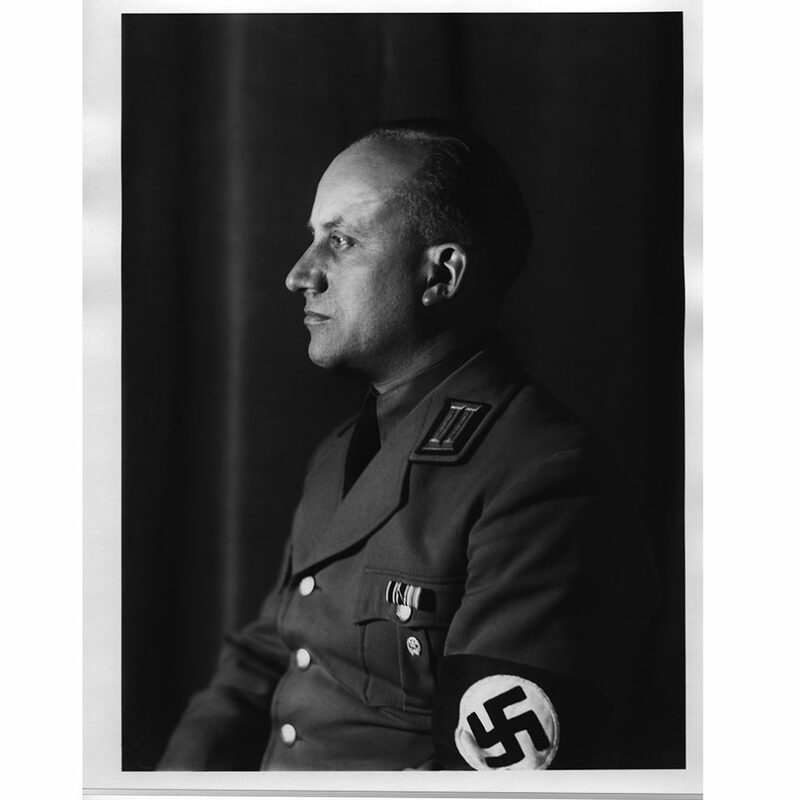 August Sander, IV/23a/10 National Socialist [Head of the Culture Department], 1938, silver-gelatin print, 1990. Portfolio IV/23a - Classes and Professions, the National Socialist © Die Photographische Sammlung/SK Stiftung Kultur – August Sander Archiv, Cologne; VG Bild-Kunst, Bonn; ADAGP, Paris, 2018. Courtesy of Gallery Julian Sander, Cologne and Hauser & Wirth, New York.